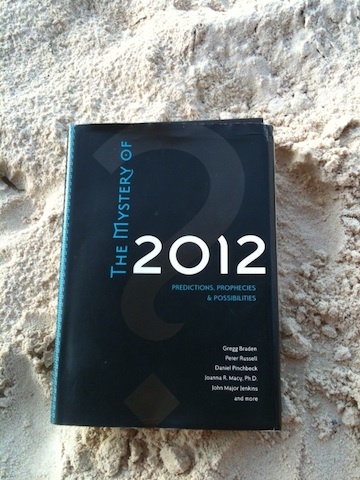 As the Mayan calendar marches closer to its December 2012 end date, many people wonder what the ‘end’ signifies. Do we have less than two years left? 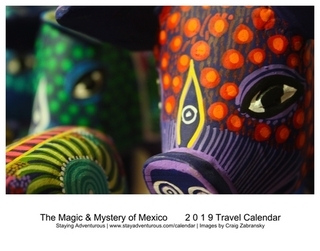 Whether an end or a new beginning (what I believe), fascination for the mysteries of the Mayan people captivate the world, well it really captivates me. And on my recent trips to the Riviera Maya, I have been fortunate enough to visit the Big 3 Mayan Ruins; Chichen Itza, Coba, and Tulum. All just day trips from Cancun or Playa del Carmen, all offering a unique view into the Mayan world, and all special. Celebrated as a new 7th wonder of the world, the Unesco World Heritage Site of Chichen Itza remains the most famous Mayan site in Mexico. 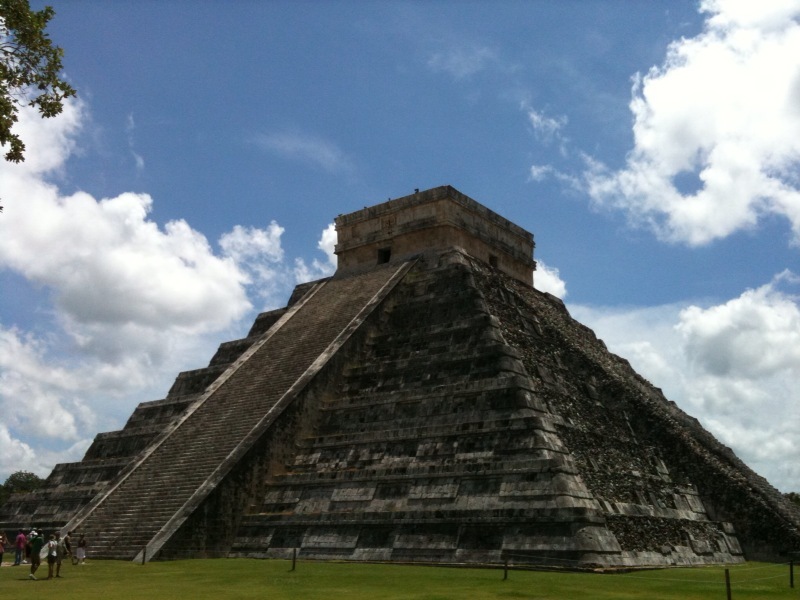 The centerpiece and most photographed pyramid, Temple of Kukulkan, can no longer be climbed, but still impresses from the ground especially on either equinox when sunlights seems to create a serpent-like image on the stairs. Another impressive site inside the ruins, the Great Ball Court, conjures up more questions than facts. The exact game rules and outcome are often debated, but most agree when the ball passed through the hoop, someone lost their head. And no visit is not complete without contemplation in front of the Sacred Cenote. It may be one of the only places to find some shade too. Tip: Bring an umbrella. 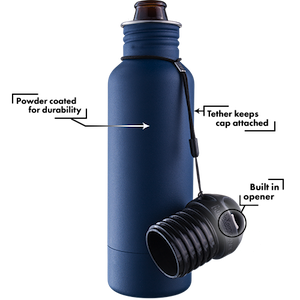 Not just for the potential of rain, but for protection from the intense sun. With limited shade on site, the strong sun can create an unpleasant experience. The least known of three main Mayan sites on the peninsula is also the least crowded. Couple that with expansive grounds and still some unexcavated ruins and travelers can feel a sense of discovery. 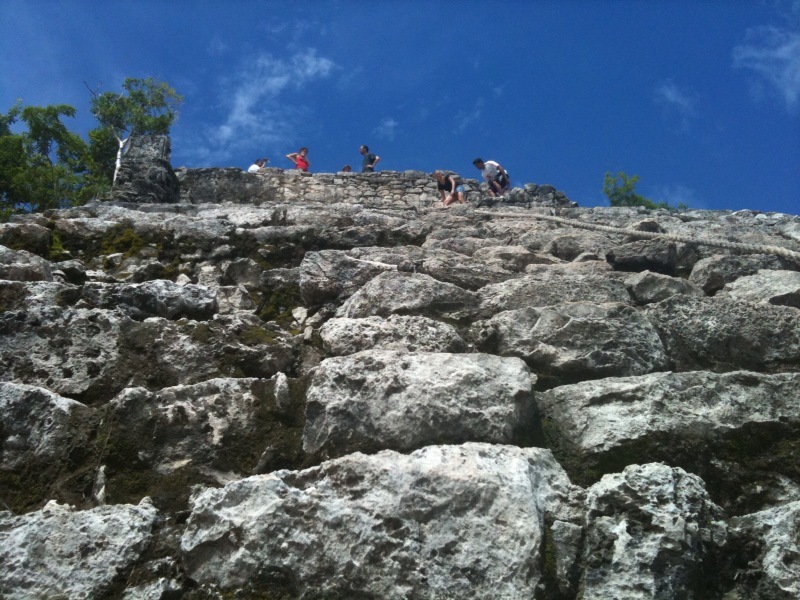 the Coba Climb.. the view at the top - worth it. Large stone tablets, elaborately carved Stelae, verify Coba served as a main trading hub inside the Mayan world. But the highlight of Coba remains the view from atop the main pyramid, Nohoc Mul. After a moderate climb up the steep stairs, visitors are rewarded with an expansive view. It’s jungle as far as the eye can see. Tip: Rent a bicycle. For just the equivalent of about 3USDs visitors can pedal through the site. It allows deeper discovery not to mention the created breeze from the motion can be rather refreshing. The smallest of the three might contain the most charm for many of the visitors. Perched up on a bluff overlooking the crystal clear Caribbean Sea the views alone draw crowds who plan to combine the tranquility of ocean with a walk among the ruins. With less grandeur than other sites, the smaller scale buildings still offer insight into the ancient civilization. The main god honored, the “Descending God,” can be seen depicted on several buildings as an upside-down figure above doorways and on a temple that honors him. The ruins date back to the late post classical period and the town seemed to serve as a port for trade. Tip: Pack a swimsuit. As seaside settlement visitors can climb down to the sand and take a swim. And on a hot day, there might not be a better way to cool off. These are my big three, but there are many more Mayan ruins to discover. And on each trip to (Mayan) Mexico, I hope to learn more about the culture and the mystery that surrounds its disappearance. This post is part of the Mexican March Madness 2011. Also, a special thanks to Riviera Maya for being an excellent guide and host to the area and Locogringo.com for the photo of Tulum and as an excellent source of information on all the Mayan Ruins in the Riviera Maya. Sarah, con mucho gusto. Always glad to be of assistance…and to guarantee an A on the report, definitely make sure you swim or snorkel a cenote; yes take a dip in the mysterious, magical mayan swim holes. You can find a few on my site here: search Cenote. Have a great time exploring and learning…. Great article about the ruins in Mexico. It brings back memories of my visit to them. Your tips were on the money. I never swam in a cenote. Sounds like it would be fun. Hola: We bought a timeshare at the Grand Sirenis in Akumal. They have a Mayan ruin on their rocky shore. I have asked numerous staff and none of them can give me any more information, as to who, when and what time period was it built. So maybes you can check it out and educate me. My wife and I have been coming to the RIviera May,Cancun area for 11 years. We were their in April and will be returning in late August. We love the Mexican and Mayan people we meet every year. I have a tremendous respect for the Mexican and Mayan culture. My Espanol is not great but I try and know its appreciated when I do. We have been to all the Mayn ruins numerous times, we rent a car and feel totally safe with never ever having a problem. I am a retired Police Officer of 30 years so I do my research and I am very aware of all situations and feel safer in Q.ROO,etc than I do in many cities in the United States. I wish more people would write blogs like this that are actually fun to read. With all the crap floating around on the web, it is a great change of pace to read a blog like yours instead. 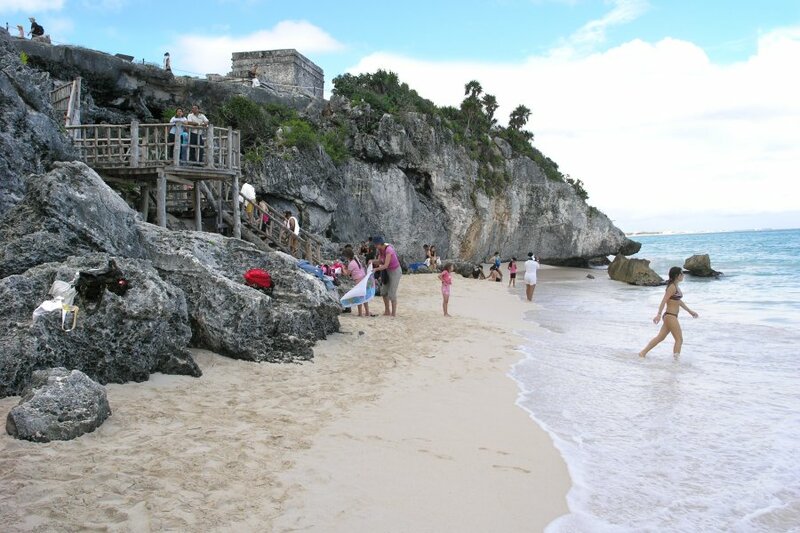 Love the tip to rent a bike in Coba…it would be a great way to cool off too! Michele, thanks. it was a great way to cool off too… and a great experience. And if you need to cool off after biking too much, there is always the cenotes.